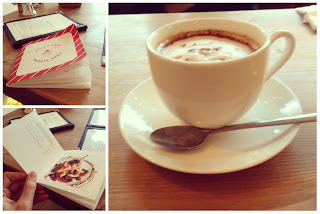 The other day, the boyfriend and I were looking for a place to kill time around Koenji, and we ended up going to this little Café called “All C’s Café”. It’s on the second floor of a building and we’d passed by it loads of times but he never wanted to go in cuz he said it was meant for kids. Lol. The inside was made up to be like a gingerbread house, and it was really cute!!! 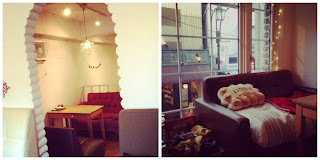 Well, actually, only one part of the café was cute… the part where we sat, by the windows, overlooking the street. It was like a little alcove of cuteness with cushions shaped like cookies and candies and really low ceilings. The middle part of the shop, however, left a bit to be desired… it was really barren with mismatched tables and chairs that look like they belong in your autie’s house or something. And it looked like the inside of someone’s apartment, which of course, it was. This space was obviously not meant to be a business, and someone renovated a large apartment into a quaint little café. I think with a bit more work, the whole thing could be really cute. But anyways, so we were basically there just to kill time until the restaurant we wanted to go to actually opened, so I just ordered a latte. Look how cute it was! It was severely overpriced though (580yen), for the tininess of that cup… *sigh* but such is life, in Japan, I guess. look at the little face drawn into the foam! They had this little old-fashioned bell that you had to ring if you wanted to call the waitress over! This is what the counter looked like… over-run with cookies, toys, cakes and cooking implements. I found it charming. These cookies basically jumped at me and I HAD to take a picture, because one of my students (incidently, my one “devilchild”… lol) is OBSESSED with this character called “kikilala”… all she does is draw kikilala pictures all over the place and ask me to buy kikilala stickers… I figured I’d take a picture and show her… lol. Overall, it was a cute place but I’m not sure I’d go back. 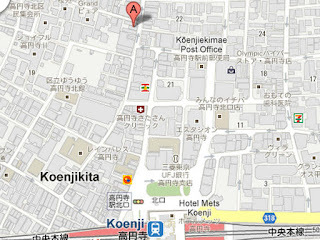 I was kinda unimpressed with the prices, and there are sooooo many other funky places in Koenji. But it’s definitely worth a look if you’re into cute things like that. 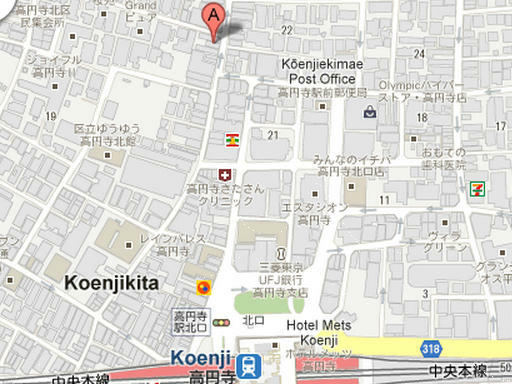 Here’s the address: I know it looks far on this little map, but it's only like a 3 min walk from the station.